Tangle of Need by Nalini Singh is the eleventh book of the Psy/Changling series. In this installment Ms. Singh includes the expected romance, tightens up her world building, and begins the slow process of closing open threads in preparation for the end of the series. Riaz found his mate in a married human woman who can never belong to him because she is deeply in love with her husband. For a wolf who is supposed to mate for life, this is a soul-breaking experience and he returns to the pack hoping the warmth of the den will help him heal, even if no one knows his truth or agony. Although Riaz is a lone wolf and needs touch to survive, he cannot abide to be touched by females other than his intended mate, until he touches Adria and passion consumes him. Adria can't even smell Riaz's scent without wanting him. After a long-term relationship with a non-dominant wolf for whom she subsumed her dominant side, an experience that almost broke her, she is not ready to give of herself again. Particularly to a dominant male who seems to dislike her even as he wants her. But Riaz and Adria desire each other too much and give in to a burning passion that quickly turns into deep friendship, seductive play and finally a soul searing love. As Riaz relentlessly fights for his soul and a future by trying to make Adria his own, for Adria it is torture knowing that Riaz can never be truly hers. Initially, I was not invested in Riaz and Adria's romance. I think this has something to do with the fact that the focus was not entirely on them throughout the beginning of the story. However as the story moved along, I became involved with both characters and hoped that they would find a good resolution to their angsty, passionate relationship. This romance goes against everything that has been established as to the changelings' mating culture: deep abiding love vs. the changeling's mating bond. Changelings mating for life has been the mantra so far, and once that mate is found, they can't have another. Nalini challenges her own world building by introducing the possibility that the love felt by the human side of a changeling can somehow be accepted by the changeling's animal side. She makes it work. There are many secondary characters from the SnowDancer pack alone vying for attention and taking the focus away from the main romance in this installment. Hawke and Sienna take a lot of page time (not that I don't love them), with some of their appearances key to the story while others seem extraneous or unnecessary. They even have their own mating ceremony! Riley and Mercy also have a very special moment in this story, and there were appearances by other secondary characters. For a while there it seemed to me as if everyone who had a romance would make an appearance and take the focus away from Adria and Riaz. Besides the romance, many events are happening at once and we see the beginning of what will ultimately be the Psy civil war. SnowDancer is in the center of the it all as they make new alliances with other changelings, and strengthen their bonds with the Human Alliance, the Psy, and old friends. The Pure Psy organization is still limping along and causing problems, and the cracks and corruption in the PsyNet are growing. Political jockeying within the Psy is as deadly as ever, and although there are no huge battles, there are some great discoveries here. The Arrows' agenda is highlighted through Vasic and Aden's characters. 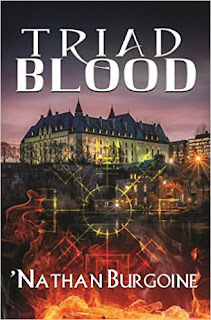 Kaleb is very much in the forefront in this installment and by the end of the book turns out to be more fascinating and intriguing than ever. It seems as if he's ready to finally come out and play. Bowen of the Human Alliance plays a small key role, and both Nikita and Anthony make interesting and history-making choices. Tangle of Need has the overall feel of a transitional book in this series -- the calm after the battle and before the war. For a change, there are some beautiful, playful, and tranquil moments to enjoy in this romance. 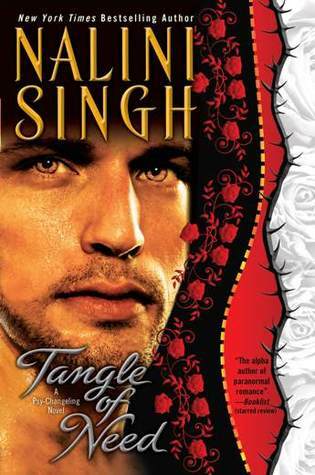 I'm fascinated how, even when the romance is not a favorite for me personally, Singh continually manages to keep me on tether hooks waiting for the next book in this long series. Her world building has not faltered throughout, and I love the way Singh challenges her own world building with authority and makes it work. As she begins to close threads, for readers, it will become a matter of paying close attention to detail. I have a feeling we are all in for some great surprises! Publisher/Release Date: Berkley/May 29, 2012 - Kindle Ed. I have to admit, I didn't really care for the romance... It's not just because it wasn't the focus, but it's also how we were presented the romance. Always small key scenes. Like almost every scene was key to the romance, the characters realizing something. I'd have liked a bit more together just to be together... I don't know if you get what I mean. I have to admit, the conflict was interesting and quite unusual. I like where Ms Singh is going though with the overall plot. By the way, Hils, do you know how many books left to this series? I know it's winding down, but I keep hearing things and not paying attention LOL. Like once the San Francisco arc is over, she could explore other packs? Nath, I thought this romance was quite a challenge for Nalini. However, I do agree with you, the romance between Riaz and Adria was overshadowed by the inclusion of all those other characters, specifically Hawke and Sienna. But yes, those key scenes you mentioned in a sense made the romance feel somehow contrived. I also love, love where Singh's going with the overall plot, and frankly that's where my B comes from. Although this book doesn't have a huge battle, it's amazing how many excellent details are included in this book and how far that overall story arc moves forward in this installment. The other aspect I loved was that peaceful, beautiful, tranquil sense that I mentioned above... I'm amazed that just as Singh is closing threads, she's also expanding and giving further details in her world building (SnowDancer pack). I loved that! Ha, I completely forgot that you went to her booksigning last year!! That's cool about the answer :P Thanks! I like the review but I'm a little confused by the story of the book - I guess it's the names, it took me a while to figure out who was a man and who was a woman. The conflict does sound interesting, like Nath says. Alex, the names can be confusing because Adria can be read as Adrian (a man's name), and Riaz sounds like a last name to me... lol! Are you reading this series? I truly liked the conflict and the way that Singh executed that aspect of it. Truthfully I was even more impressed by it because recently I read a PNR book by another author who attempted to do the same and in my opinion failed to challenge her world building in respect to proving that love can overcome the mating bond. Although for reasons stated above the romance was not a favorite for me, Singh definitely made that aspect of it work so that in the end the HEA was believable. Good stuff. *jealous* This isn't out in the UK until next week. But I do think any book following KISS OF SNOW has a lot to live up to. Oh Li! You have to wait? That's the way I feel about Canada, lol! Books always release there earlier than in the U.S. I agree, the romance was...well, I wasn't convinced by it and I'll write a comment about it in my blog. Hey Sonia! You read it, yay! Hawke and Sienna... sigh... I adore them too! LOL, don't get me wrong! I enjoyed their scenes together, it's just that their story was told in Kiss of Snow and my focus moved on to Riaz and Adria. BTW, I loved Hawke and Sienna up to the mating ceremony -- that was a great scene. It's also interesting that in this book, my favorite quote is by Hawke about Sienna... not a Riaz/Adria quote. I'll put it up later. I think that says much about the romance. I see what you mean and I understand, believe me! Regardless of the fact that NS showed that there's true love between the two protagonists, you wanted them to develop the mating bond in this book because that's how "changelings" show their forever love in this series. For me, it was wonderful that NS chose to highlight the fact that love for loves sake can also be "ever lasting." And, that the mating bond, although a promise of forever to a changeling, doesn't make loving another any less real or enduring. I think if Riaz' "mate" had been another changeling, however, I believe that it would have been much tougher for Singh to swing this storyline, but because Lissette is a human, it became a possibility. I can't wait to read this one. Nalini never disappoints.. she always manages to pull a great story together. I like the fact that this romance is complex and a struggle within the boundaries of the whole mating thing. You have to imagine things like this are going to happen in this world. It looks like you tend to review the even number books in this series, Hilcia! How funny. Christine, Nalini hasn't really disappointed me yet with this series. I would love to read your thoughts on this relationship. I thought she met the challenge. And lol, Christine! I noticed that too when I was putting up my list of books reviewed. This is the first "odd" book from this series that I review. Strange, right?